Cover Image: Elliot Wilson of Pioneer Earthworks operates the drill at Alaska Transportable Array station D27M. Photo by: Max Enders, IRIS. 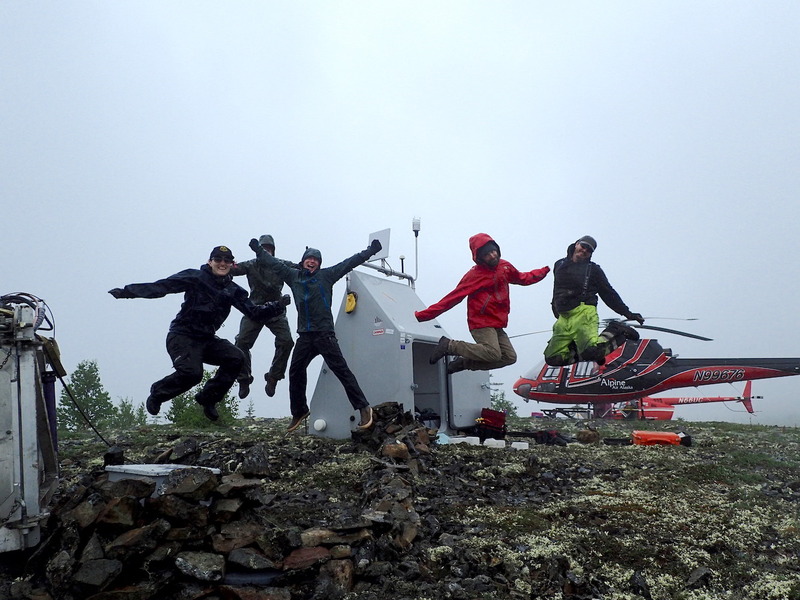 After covering the lower 48 United States from coast to coast with a grid of nearly 1700 sites, the final seismic station of the EarthScope Transportable Array has been installed in Alaska! Above: Map of the EarthScope Alaska Transportable Array stations (red symbols). 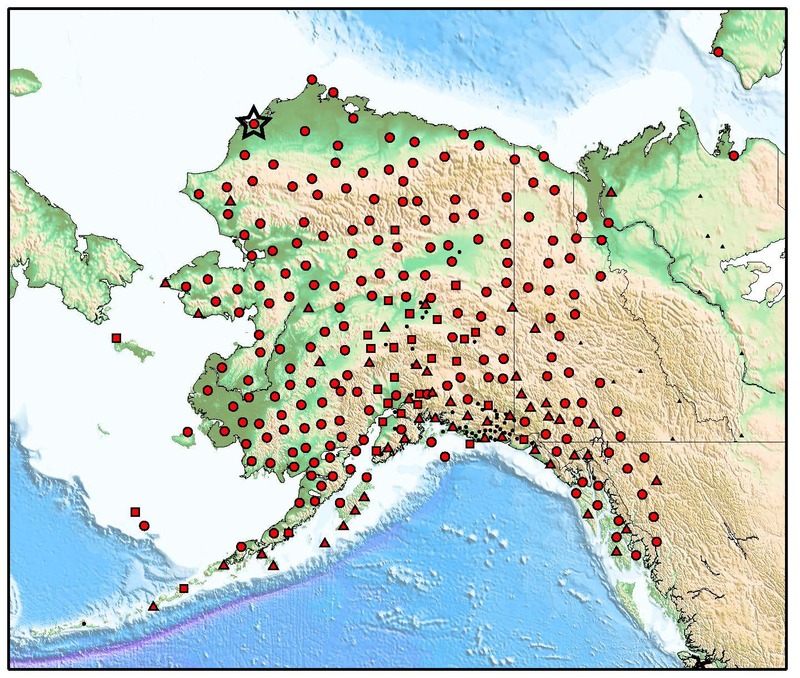 Circles are new seismic stations, squares are stations upgraded with a posthole sensor, and triangles are existing stations operated by collaborating networks (Alaska Earthquake Center, Alaska Volcano Observatory, Alaska Tsunami Warning Center). Station A19K is starred. Station A19K (starred) lies on the edge of an abandoned airstrip 127 miles southwest of Utqiaġvik (formerly known as Barrow), the most northerly city in the United States. 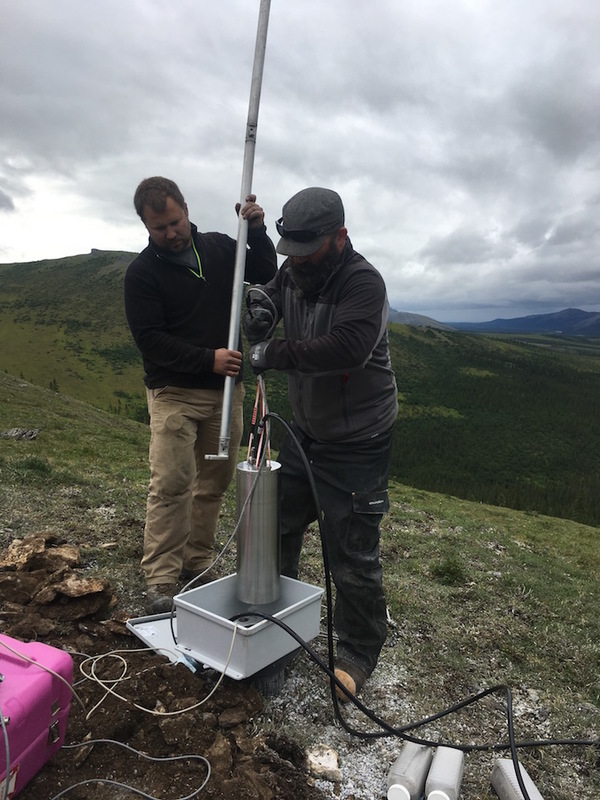 This station completes installation of the currently operating 280-station network that continuously records ground motion from local, regional, and global earthquakes and broadcasts its data in real time from the last frontier. The success of this ambitious scientific endeavor is largely due to the focused efforts of a small number of employees who have coordinated complicated shipping schedules, obtained diverse land use permits, and spent the past three summers navigating poor weather conditions, fires, and wildlife across Alaska and western Canada. Image (Left): The field crew lowers a seismometer into a cased 2-3 meter deep posthole. Staff at the IRIS Alaska Operations Center have been supported by the Array Operations Facility at New Mexico Tech, the Array Network Facility at University of California San Diego, the IRIS Data Management Center, and IRIS Headquarters. Support from the Alaska Earthquake Center has also been invaluable, along with the cooperation of the Alaska Volcano Observatory, Alaska Tsunami Warning Center, UNAVCO, Canadian Hazards Information Service, Yukon Geological Survey, Yukon Wildlands, and Natural Resources Canada. Data are archived at the IRIS DMC under the _US-TA network code. For more information about the Alaska Transportable Array, click here. Image (Below): The field crew and pilots celebrate the successful construction and installation at station H20K (also known as Station H2Okay!) despite variable weather conditions and visibility.